There is something distinct about a side part haircut that makes a man look very refined, and this is what makes most men include in their styles. It also works for most face shapes, and you can have it as part of any hairdo. It is a flirtatious, clean and also very classy hairstyle that every modern gentleman should try out at some point. This gallery will give you some ideas of how you can make it part of your style and you can be sure of finding something that will impress you from the 45 trendy haircuts. If you have a beautiful naturally dark toned hair like this one, then you will not have to do much to create a refined look. This design only requires you to leave some neat and long locks on the crown and give the sides a high fade and a razor line. You should then finish by combing over the long hairs in layers. Vintage haircuts are all about using a generous amount of gel in styling. However, this one has a modern touch that comes from up sweeping the wavy strands on the crown slightly. It also has a hard side part that creates a disconnected look. The neat razor line on the sides is what makes it possible to style these feathered strands. And their styling is very simple as you only need to sweep them back in subtle layers. The style also has a beautiful skin fade on the sides and back that helps to expose the lovely tattoos on the head. A haircut like this one is what a gentleman needs because it will make him stand out from the rest. It entails leaving some smooth brown locks on the top and giving the side and back a taper fade. And to finish the design you only need to give the long locks an impeccable slick back. The taper cut on this design is as elegant as it can get because it allows you to maintain hair throughout the head. This charming headdress also has a soft part line on the side that you should use to sweep the tapered strands to the sides and back. The natural gray color of these strands is the first thing that will draw your attention. These strands also have a beautiful taper cut that maintains some length on the crown, and you should finish it with a side part and brush back. Most people will not know that this is a classic pompadour because it has a modern twist that makes it look very different. Apart from the dazzling golden shade it also has a sharp parting on the sides and skin fading that gives it a unique appearance. Replicating the layered brush back in this design should not be a problem because you only need to use some gel and a comb. However, the amazing taper fade on the sides will require some skills to get right, and if you add a side part on the design, you can be sure of a very elegant headdress. The dazzling wavy strands on the crown make this design look complicated but it is not. In fact, you will only need a hold product for this. But, only a good barber can create the perfect razor line on the side and the high bald fade that are the highlight of this design. If you are wondering what to do with your fine hair here is a beautiful cut that will work for you. It is a vintage design that entails giving the sides and back a bald fade and styling the long hair on the crown with a side part and by brushing it back. This scissor cut has a smooth texture that comes from trimming the healthy natural strands keenly. The strands also have a beautiful taper cut that reduces their size very gradually. And for styling you only need to create a soft side part and then finish by combing back your strands smoothly. Not every man wishes to go with the traditional long top and short sides design as some prefer to maintain a decent length throughout. If you are among them, then here is a cut for you that will require tapering the hair low at the back and then styling by forming a part on one side and brushing the stands back smoothly. A slight razor fade on the sides and back is all that you need to create this style if you have a beautiful and straight natural hair. The beauty is all in the styling, and it entails forming a part on one side and then using it to comb over the strands sideways and in stacks. However, you also need to give the top strands a slight lift and sweep them back. The quirky pattern on this design comes from using the natural growth pattern of the strands to form a unique style that starts with the side part at the front. These strands also have a beautiful golden blonde shade, and they are very smooth making it easy to style them. Any man can achieve this haircut as it is as effortless as it can get. It only requires you to leave a short hair on the crown and give the sides a taper fade. You should then create a razor line on the side and comb over the locks on the top to form a perfect side part haircut. This haircut is all about the height and thickness of the beautiful strands on the crown. However, they also have a lovely brown shade, a neat side part, and a fantastic tapering on the sides that help to create a top notch design. 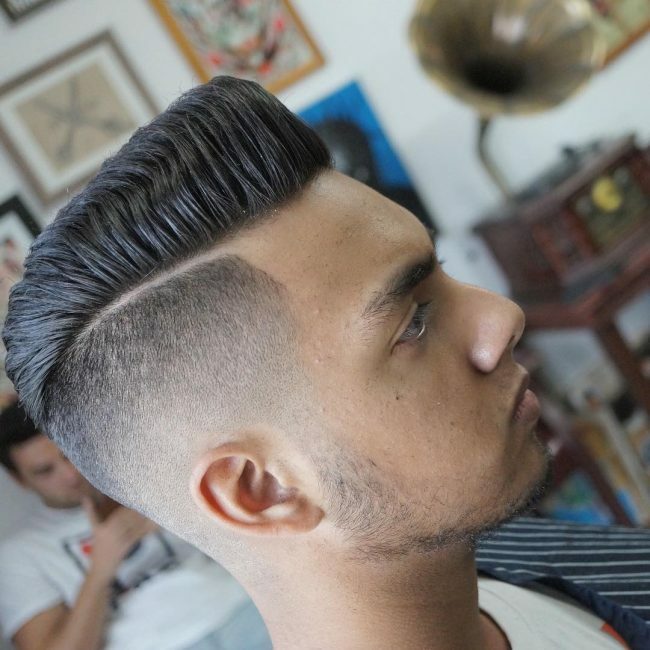 Here is another variation to the classic pompadour and it entails making it shorter than the traditional one. You should also give it a nice taper fade and then style with a simple side part and by sweeping the pompadour sideways slightly. This style is perfect for men with thick hair that prefer to maintain some length. It involves leaving some medium size locks on the crown and a smooth fade on the sides. You should then give the long strands a hand painted dye job with red and pink hues and style with a side part and by sweeping the locks sideways. This fancy headdress is a modern variation of the traditional quiff, and it entails giving it some lift for an extra height at the front and making it appear voluminous. The sides should have an undercut that you should spice up by giving it a skin fade. Traditional designs such as a Mohawks and the pompadour might not be ideal for a long face like this one because they have an elongating effect. However, you can still have them but with a twist like in this style that has a pompadour with a slicked back design. You can also flatter it with a side part and a taper fade for a modern finish. The texture and volume of these strands are excellent, and this is what makes them easy to style. Their styling entails tapering them on the sides, creating a side part and leaving some feathered locks on the crown that you should style by brushing back. This straightforward side part haircut is perfect for any man who wants something comfortable that will not require a lot of work to create. For this style, you only need a side part, a taper fade on the sides and some long locks on the crown that you should style with a lift and comb over. Although this is a very ordinary cut, the side-part and styling make it look unique. To create this look, you will need to leave some long strands on the crown and form a part on the side before tapering the rest of the hair. And to finish the look you will only need to sweep back your hair diagonally. A side part haircut can also make a perfect formal headdress. This particular one is a good example of this, and it entails forming a neat and short tight quiff on the crown, giving it a razor line on the side and finishing with a fade on the undercut section. Modern haircuts do not have to be complicated to look stylish, and this simple hairstyle proves this. You can create it with any hair type, and all that you need to wear this fabulous hairdo is a simple side part line and a cute fading on the sides and back. The thick bangs on the top of this hairdo also have an amazing texture, but their innovative styling that entails layering them in a square pattern is what make them look unique;. This fancy hairstyle also has a beautiful fade on the sides and some defined outlines that will make any man look very polished. The classic pompadour comes in many variations, and this is what makes it a perfect design for a man looking for something that will get him looking elegant. This fantastic one is lower than the traditional design, and it also has a nice taper on the side and a soft part line at the top. How you style the long strands on the crown determines how attractive your hairstyle will look. Apart from the part on the side and the skin fade this haircut also has a beautiful style that entails giving the long locks a slight lift and running your fingers through to provide them with a messy appearance. Although the dazzle in the brown shade of these strands makes a huge difference to the look, the cut is the most important thing in the headdress. It entails forming a short and sleek pompadour and giving it a side part before finishing the sides with a skin fade to create a clean and trendy appearance. The taper fade on the sides of this haircut is lovely, and it combines with the soft side part to create a refined look. However, the hairdo also has some beautiful dark toned strands in the middle that you should style with a slight comb-over and by brushing them back. If you would rather keep things short and sleek, then this is the perfect hairstyle for you. To create it you should leave a short hair on the top section, give it a side part and a high fade on the sides. And for styling you only need to gel and brush back your strands smoothly to provide them with a neat and elegant finish. This beautiful haircut has everything that you can ever wish for in a fancy headdress. To create it you only need to leave some long and thick strands on the top and give the sides a smooth fade. You also need a hard side part to create a cute disconnection between the sleek top and the faded sides. It is always a good idea to give a modern touch to a vintage haircut to make it look trendy. This beautiful hairstyle is a perfect example of this and to create it you will first need to give the sides and back a taper fade while leaving some long locks on the crown. And to finish the look you have to comb over the long hairs at the top. There is nothing unique in this haircut, but the skilled part on the sides and the tapering are what makes this a distinct style. Instead of just leaving a long top you should also give it a slight lift at the front and a lovely comb over from the side-part line. This headdress is just flawless, and if you can replicate it, then you can be sure of an outstanding appearance. To create it you should leave some extra-long strands at the top and style them into a tall and fancy quiff that you should disconnect from the rest of the hairs with a hard side part. You can have a fade on the sides, but a taper is the best as it lets you maintain a nice length on the sides and back. Some men prefer to keep a long hair even when they want to style it level. This haircut is perfect for this group of men and to form it you only need to trim your long strand and give them a taper at the back before styling by layering. A side part haircut could not look better than this one, and this is not only due to the lovely golden blonde shade but also the excellent cut. To create it you should taper your golden blonde locks on the sides and give them a side part. For styling, you should give the ones on top a slight up sweep make them wavy. This design entails leaving some long strands in the middle of the head and chopping the sides to form a faux hawk. However, the longer hair in the middle also has a nice texture and height with the side also having some razor lines that help to enhance the look. An undercut is a unique part of any haircut because it gives you many styling options. The one in this design has some beautiful razor lines that give it a modern appearance. Apart from this the strands on top also have a nice comb-over style. This beautiful headdress is another perfect one for men that like to maintain some length on their hairdos. It is a straightforward design that entails keeping some extra-long locks on top of the head and fading the sides. And for styling you only need to make the long top spiky and taper the sides and back. Color can also help to transform your side part haircut into something magnificent, and this hairstyle shows this. It has a beautiful strawberry blonde shade and an adorable cut that entails creating a part and giving the sides a taper fade while leaving some wavy strands on the crown that you should style with a brush back. These brunette strands have not only a perfect color but also a fabulous cut. 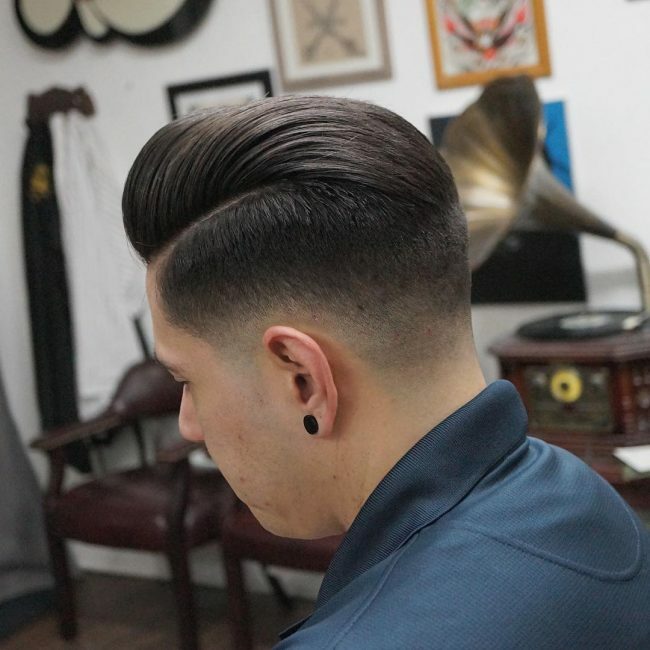 The haircut entails using a side part to form a disconnected undercut between the dimensional upswept strands on the crown and the short tapered sides. Using a quality gel is inevitable if you want to create a fancy hairdo like this one that entails leaving some long strands on the crown and creating an undercut on the sides. You should then give the undercut a skin taper and then finish by sweeping the long strands to the side over the undercut. The shine on this haircut is enough to convince any man to try it out. To create this hairdo, you should have a regular long top and short sides style. The next step is to use a quality gel or pomade for a perfect hold and then style the strands with a swirly side sweep and finish by spraying the hair to get the dazzle. Blonde is a beautiful hair color, and you can be sure of a gorgeous look if you give it a nice cut like this one. The design entails leaving some strands on the crown to form a short pompadour, creating a side part and finishing with high taper on the sides. A side part haircut is a clean and neat hairdo that every man should try at some point. You can combine it with any other design that you wish, and so this makes it one of the most versatile haircuts for a modern man. Look through the gallery above for some ideas on how to have a side part as part of your hairstyle.